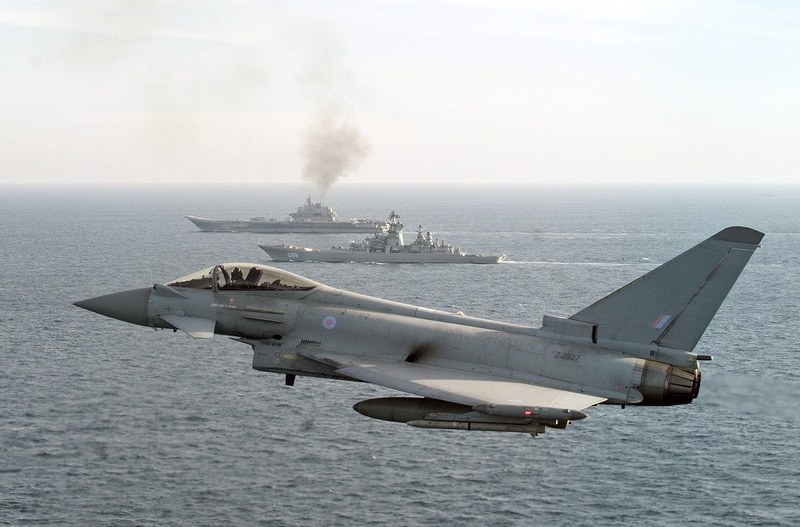 A RAF Typhoon escorts the Russian warships Pyotr Veliky and Admiral Kuznetsov. Navies have a duty to protect national waters and Russia would do the same. Russian military experts were not surprised that the Royal Navy spent $1.7 million to follow Russian warships last summer as they passed near the British coast, and it’s in fact a small amount in terms of the UK’s overall military budget. "The English acted in the interests of their country," remarked Commander (Retired) Igor Kasatonov, former head of Russia’s Black Sea Fleet. "Following foreign ships that are close to one’s shores is a normal practice for any country. The servicemen must stay close to foreign ships in order to have a clear understanding of what is happening and what the other side is doing." This money would have been spent with or without the Russian ships passing through the English Channel, experts said. The Russian naval group included the Admiral Kuznetsov, the only aircraft carrier in the Russian navy. "They have money budgeted for combat preparation and conducting expeditions, and knowing that the Kuznetsov would sail close to British shores they had obviously planned such expenses," explained Captain (Retired) Dmitri Litovkin, now a military observer at Izvestia. "This is a part of the defense ministry's budget, which would have been spent on the need's of the navy anyway." This peaceful naval encounter gave both countries a unique training opportunity. "The English practiced intercepting this group and hitting it with a missile," said Litovkin. "Such military procedures are absolutely normal, and we also carried out certain tasks and used them for practice. This was training for both sides." Admiral Kasatonov confirmed such practices among the navies of various nations, but emphasized the Royal Navy’s more practical use of this opportunity. Shadowing the Russian ships allowed the British military to test and update their intelligence on the Russian aircraft carrier. "Closely following foreign ships is part of reconnaissance, to see if there is anything new on these ships, whether they have new technology," said Kasatonov. The Russian naval group headed by the Admiral Kuznetsov aircraft carrier arrived in the Mediterranean Sea on Nov. 1, and joined the anti-terrorist operation in Syria two weeks later. Earlier this month, the Admiral Kuznetsov sailed to the Russian port of Severomorsk in the framework of a reduction of Russia's military presence in Syria.